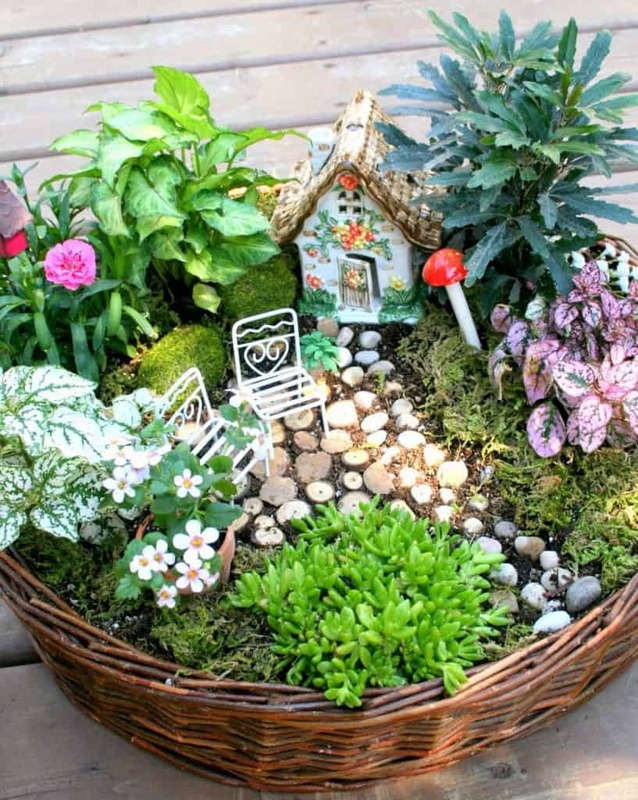 A fairy garden is your way to create a fantasyland at home. Many DIY Garden Ideas use creative plant arrangements, beautiful flowers, and garden decorations. These inspirations will help you create a dreamland in your own garden. This fairy house was created from two birdhouse gourds. The top parts of these gourds were cut to create a roof and house building. The shingled exterior was made from pinecone scales. The window and door were shaped from painted polymer clay. The house became a unique view among ground flowers and foliage. 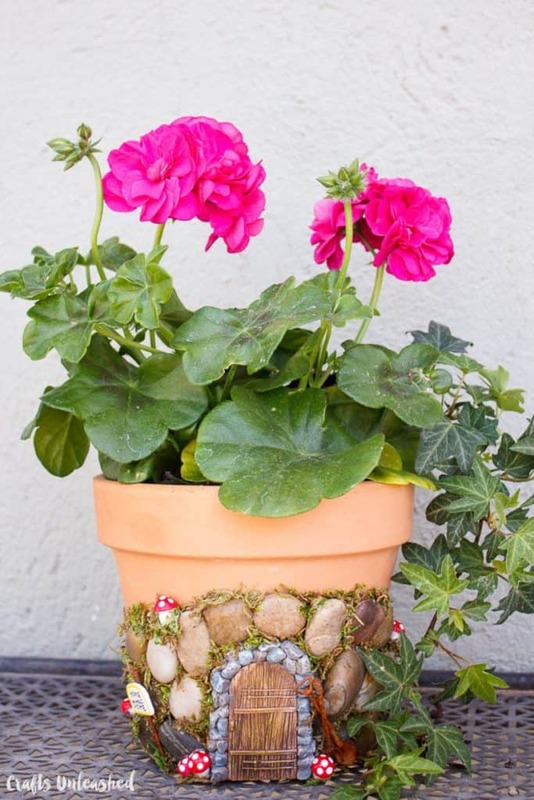 Create fairy garden containers by slapping decorative decals on flower pots. This little door makes you think that a fairy lives in a terracotta pot. The door was created from riverbed pebbles, old wood, and preserved moss. The other ornaments, such as mushrooms and “Home Sweet Home” sign, were from a craft store. 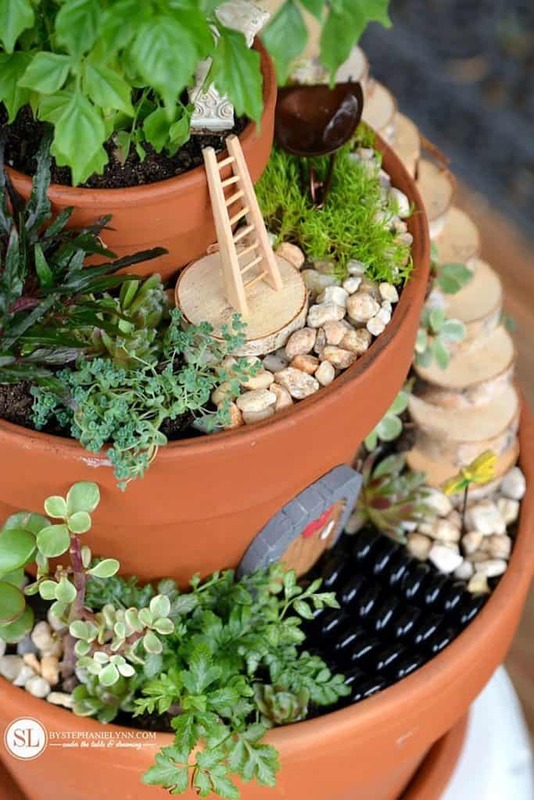 This miniature fairy garden was arranged using different-sized pots. The pots were stacked and given drainage holes. You can choose any plants you like before arranging mini wooden logs, miniature chair and tea sets, and a tiny ladder. This whimsical arrangement is perfect for decoration in a small house. In this fairy garden, the decoration is more prominent than the live plants. Mini plants gave way to a set of fairies and gnome statues. Miniature bench, mushroom, door, and flower pot are available at craft stores. You can get creative with any arrangement you like. 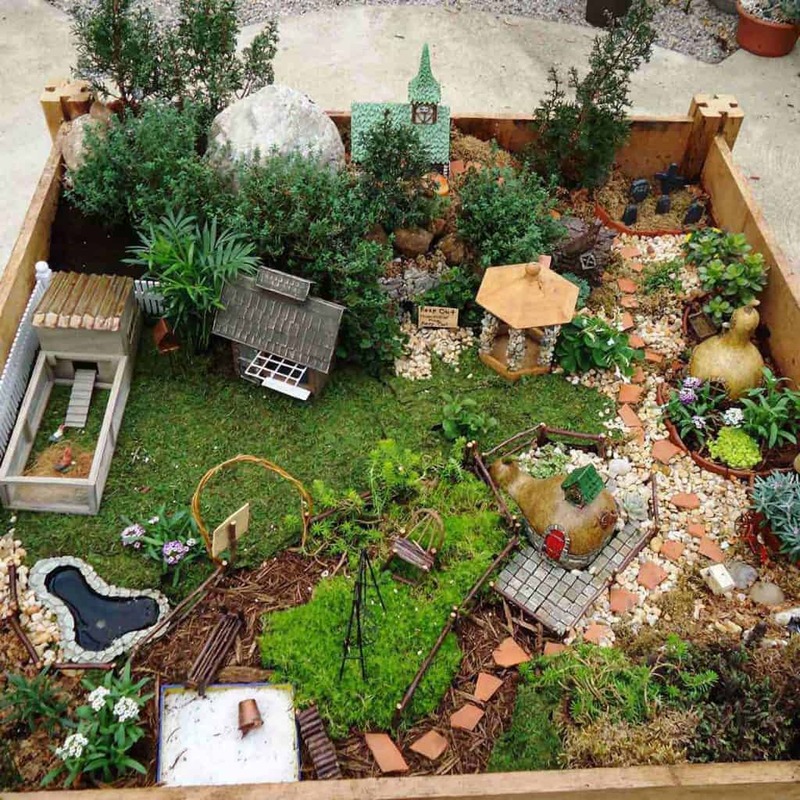 This mini garden serves as a miniature copy of a real garden. A large planter with soil is a perfect ground to create the model. 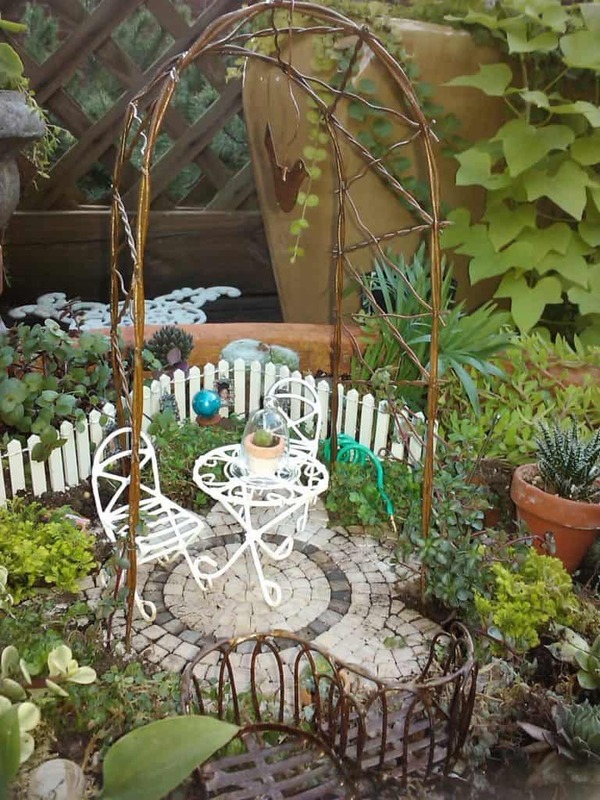 Mini plants, pebble formation, mini garden seats and table, and ornamental craft objects were combined to create a real-like miniature sanctuary. This lakeside house model was created on a barrel. Glued play sand created a nice lake area, with blue glass gems as the water. Miniature house, dog, furniture, and fairy are available at craft stores. Mini plants were placed on the edge, so they can serve as the “trees” and “shrubs” for this house. 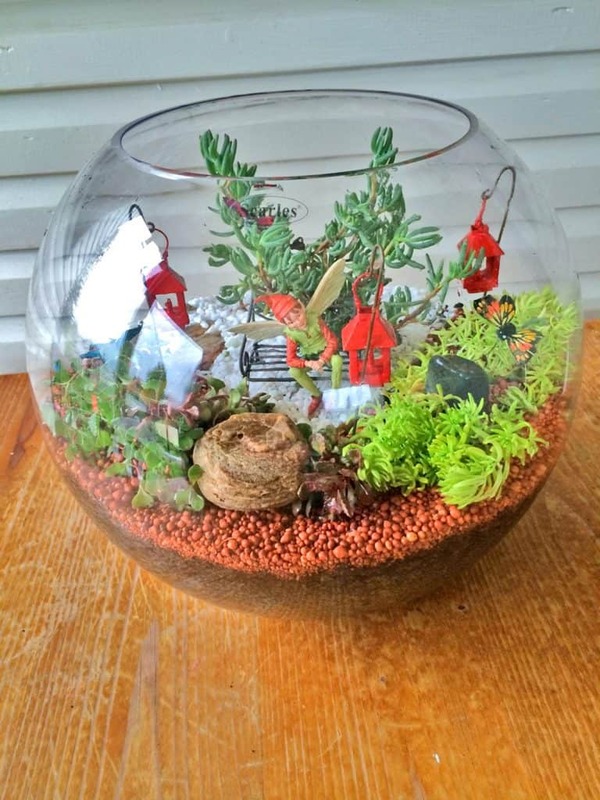 Terrariums are perfect media for indoor fairy gardens. 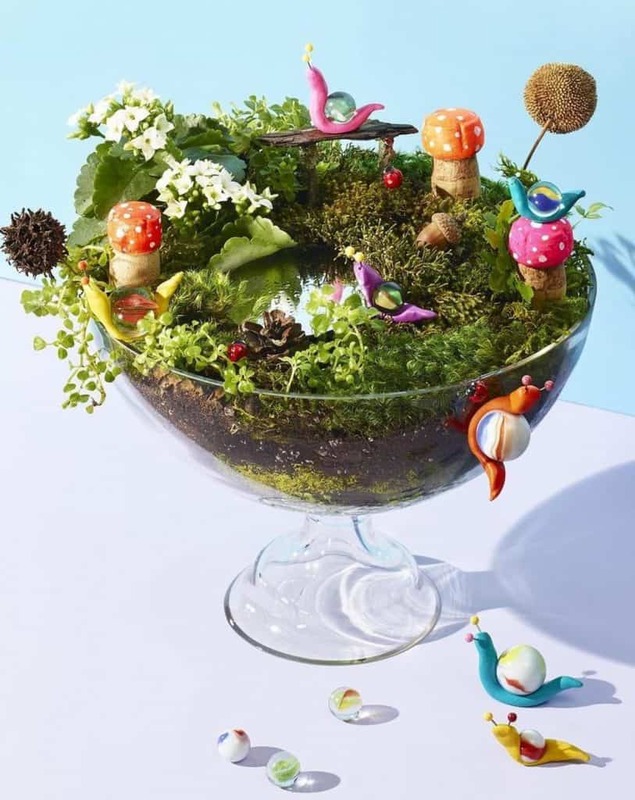 In this example, the mini garden was arranged in a glass bowl. Mini succulents were planted on potting mix, gardening charcoal, and pebbles. A fairy figurine, several mini lanterns, and fake butterfly created a cute fantasy world. A grey stone pot with pebbles is a great place to contain a mini spring garden. Combining spring flowers and mini greens creates small “forest” for a fairy figurine. Pebbles, a mini cabin, and miniature flower lamp create a cute fantasy world. A lush Hobbit hole is a popular inspiration for gardeners who love Tolkien. This Hobbit hole was built in a grass-covered ground. 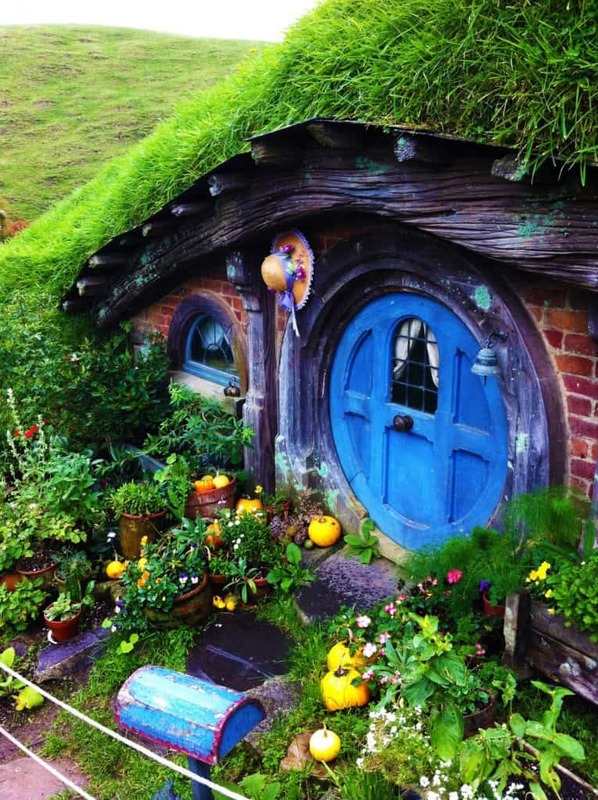 The round wooden door, windows, rustic garden, and colorful postal box create the iconic combination all Tolkien lovers will immediately recognize. 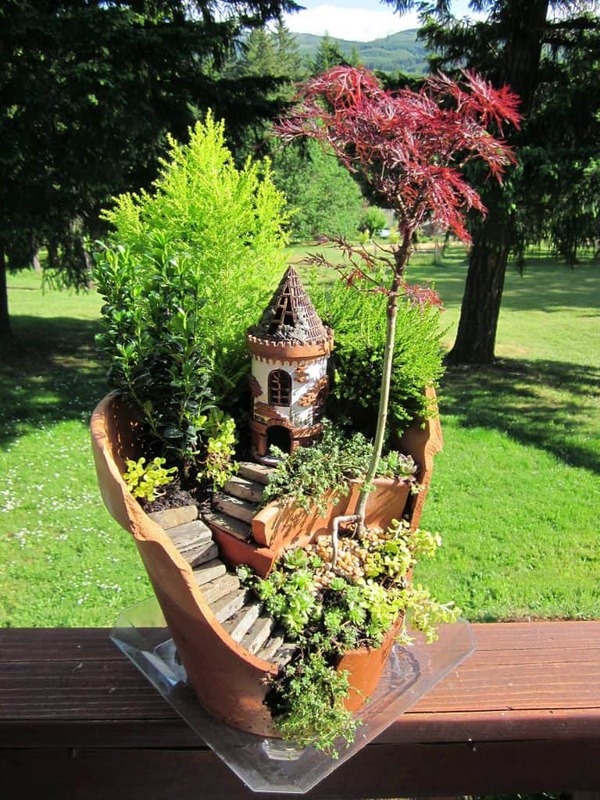 A tall garden pot can be turned into spectacular “fairy castle”, complete with rock “stairs” and mini plants. This pot has its one side removed to arrange flat rocks, pebbles, and mini plants. A miniature castle was placed on the top part of the pot. 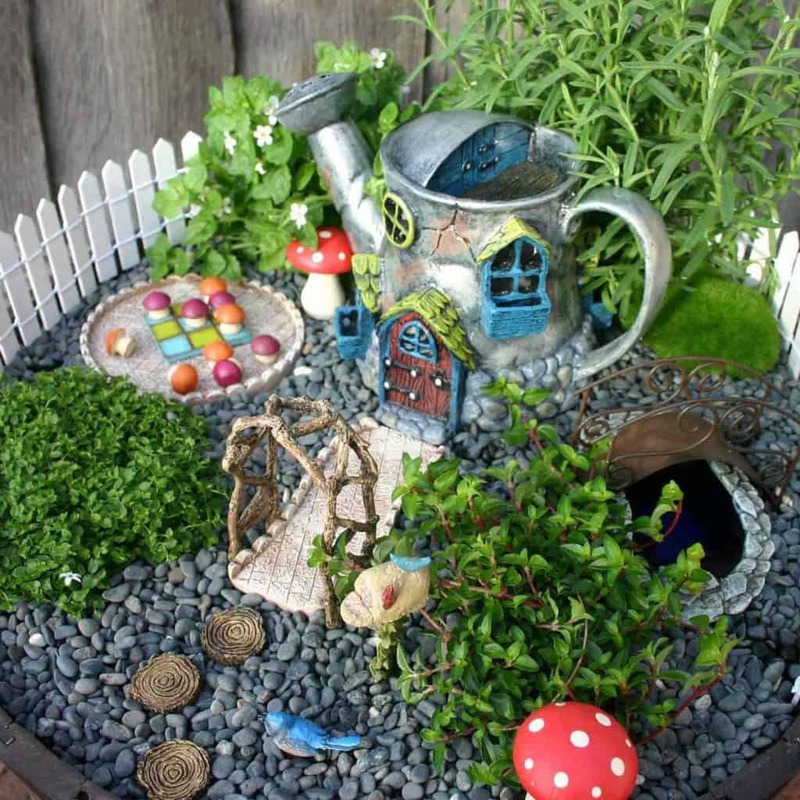 A kids fairy garden is a cute project you can do with the little ones. Fill a glass bowl with soil. Arrange several mini succulents, herbs, and greens. Add small, cute ornaments such as snails, mushrooms, birds, and many more. You can also add mini decorations like marbles. 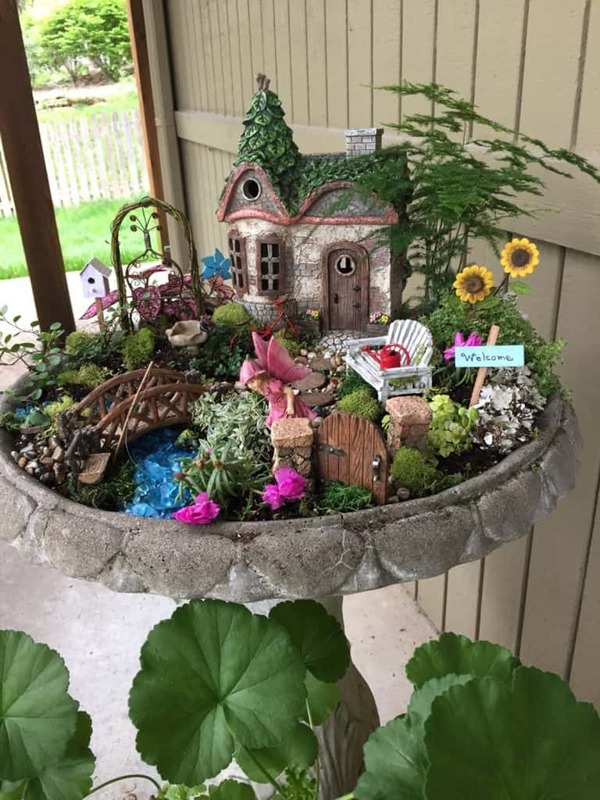 This fairy garden used a round woven basket as the container. The inside has spring flowers, mini succulents, and plants with colorful foliage. Pebbles were used to create a “garden path”, which leads to a miniature cabin and garden seats. 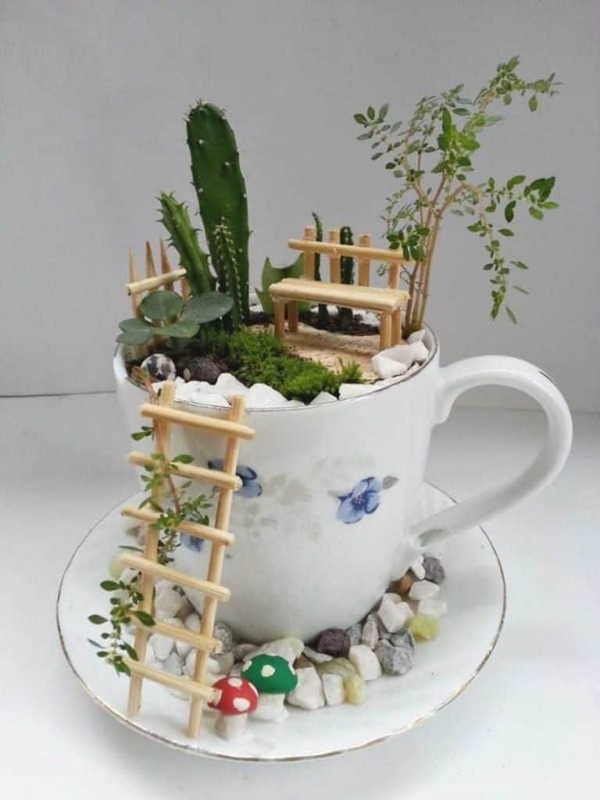 This fairy garden was created in a tall teacup. It was filled with pebbles, mini ladder, seat, and fence. Small plants and vines were arranged to create a “Zen garden” look. The cup was glued to a saucer, with pebbles and miniature mushrooms around it. 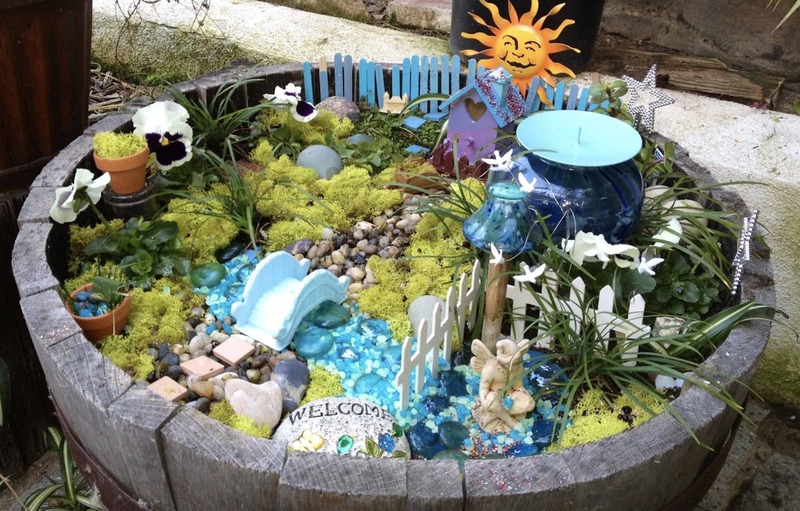 A birdbath is ideal for creating a fairy garden. This garden consists of a stone cabin, garden seat, mini bridge, swing, and fence door. The arrangement is surrounded by mini flowers, mosses, succulents, and shrubs. The “Welcome” sign makes this garden more charming. 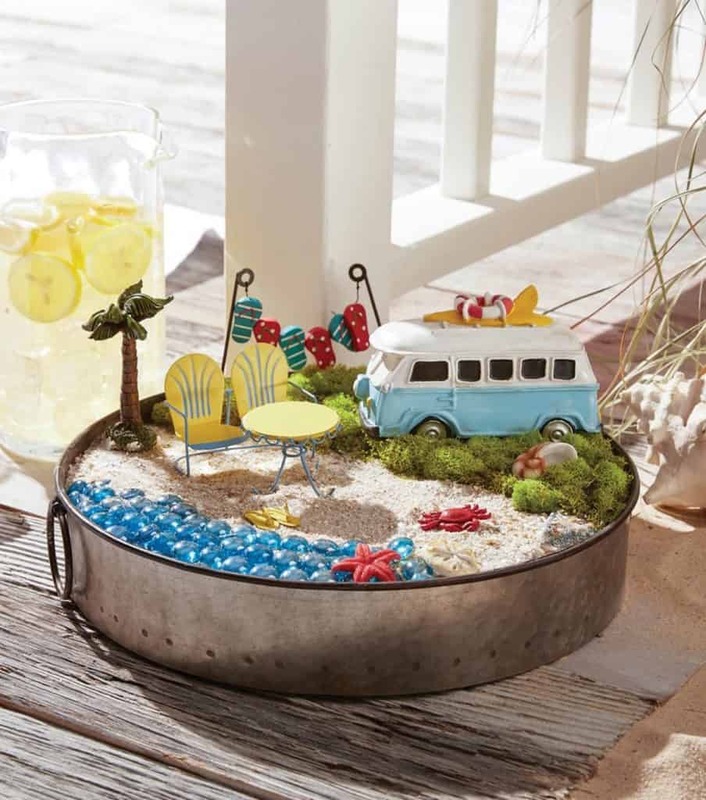 An unused baking tray is perfect for creating a beach-themed fairy garden. This garden only uses deer moss as the green element. The garden consists of sand, blue gems for the “ocean”, Styrofoam block as the base, and beach-related ornaments. 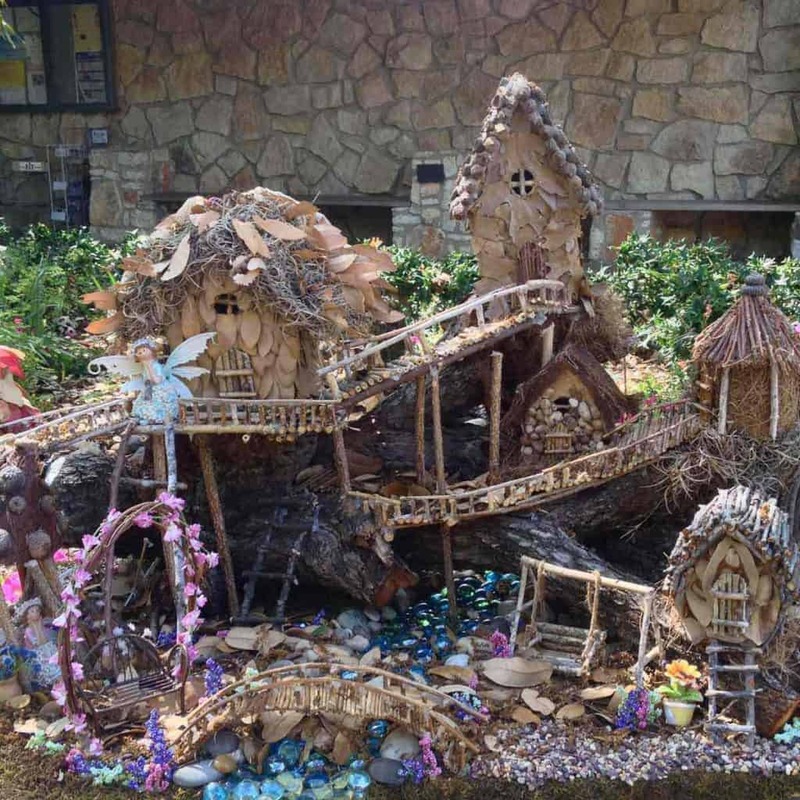 The Zilker Botanical Garden in Texas has an outdoor fairy garden collection called the Faerie Trail. It consists of whimsical fairy gardens created in a kid-friendly forest trail. In this picture, a fairy town was built from twigs, branches, pebbles, rocks, leaves, roots, and small figurines. 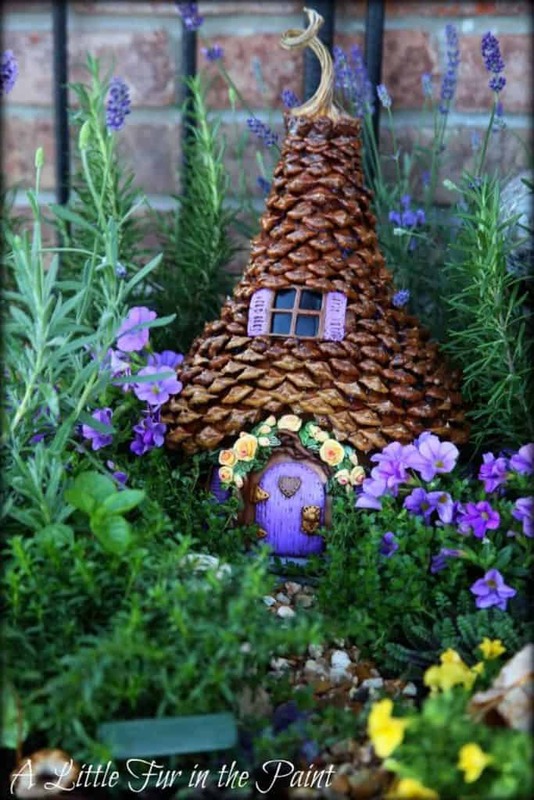 A wooden box is a great place to create a fairy garden. You can create any garden size depending on the box’s measurement. 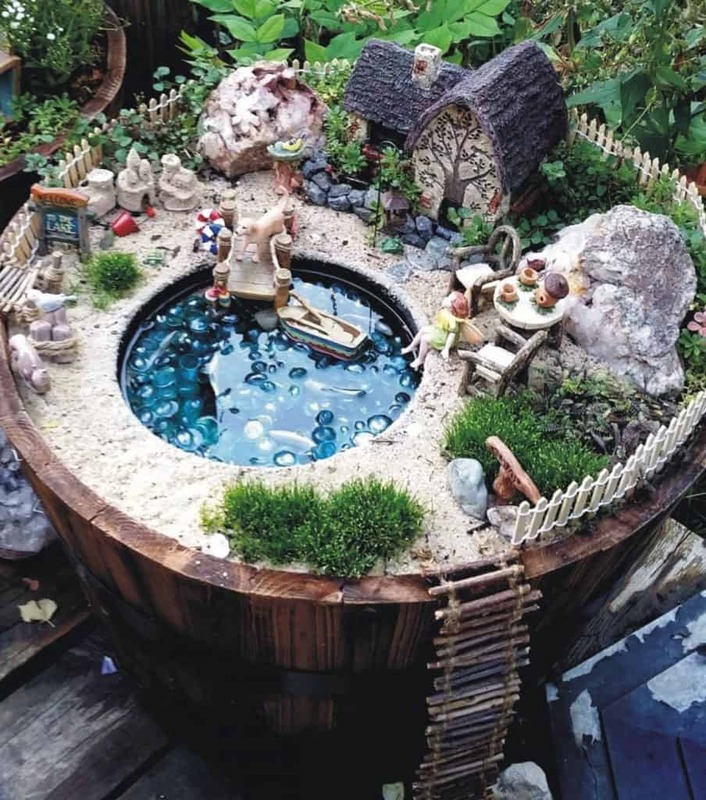 This fairy garden consists of a miniature house, church, chicken coop, gazebo, and pond. The mini plants were strewn to create the “trees” and “shrubs”. 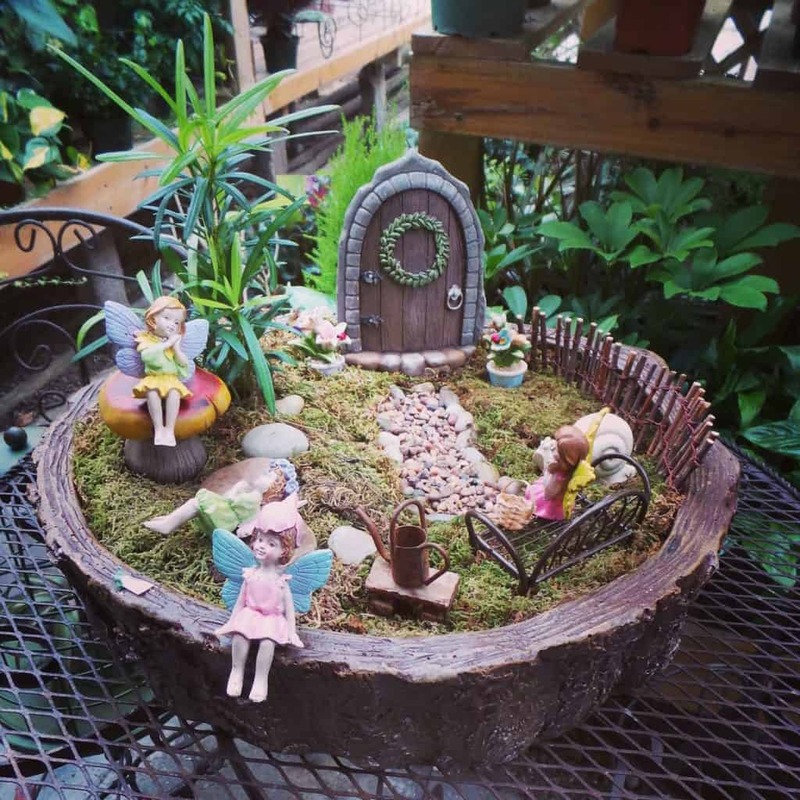 This fairy garden uses an old watering can as the substitute of a fairy house. The painted decals look great when paired with dark pebbles, miniature mushrooms, bridge, and mini plants. 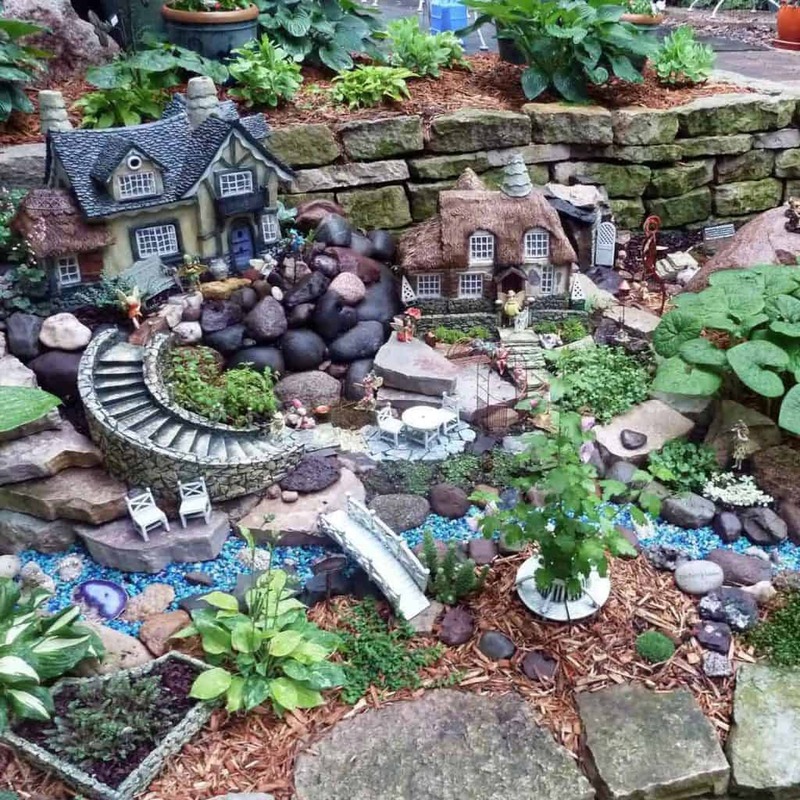 Landscape yard has various great surfaces to create fairy gardens. This garden was created near brick planters. The garden consists of houses, stone stairs, miniature chairs, and piled-up stones for decorations. 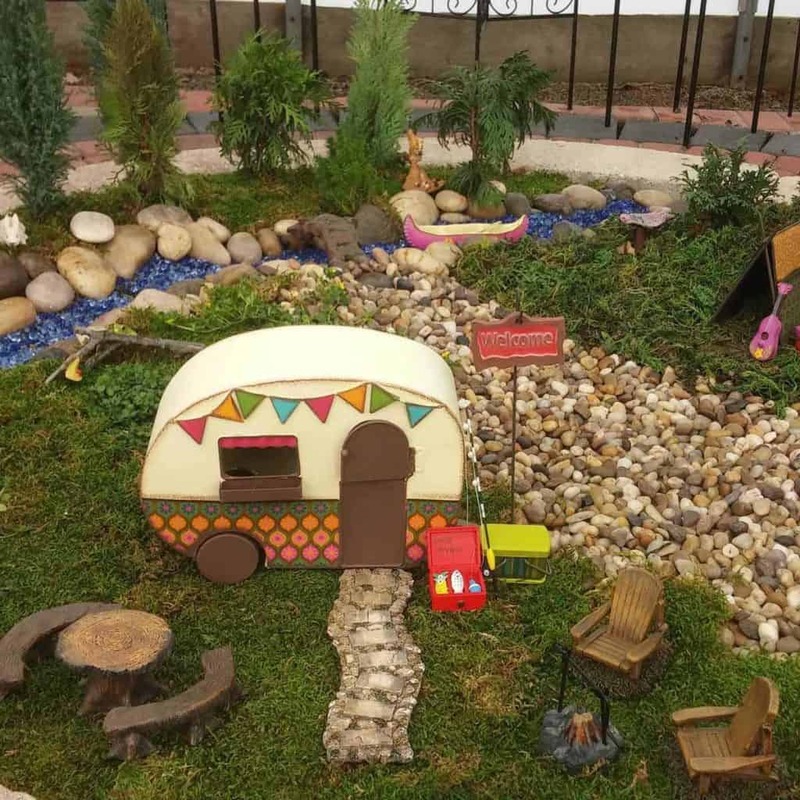 This fairy garden uses a miniature caravan to substitute house model. The caravan, seats, and table were placed on moss carpet. The rest of the surface is covered with pebbles. Blue glass gems were turned into the river. 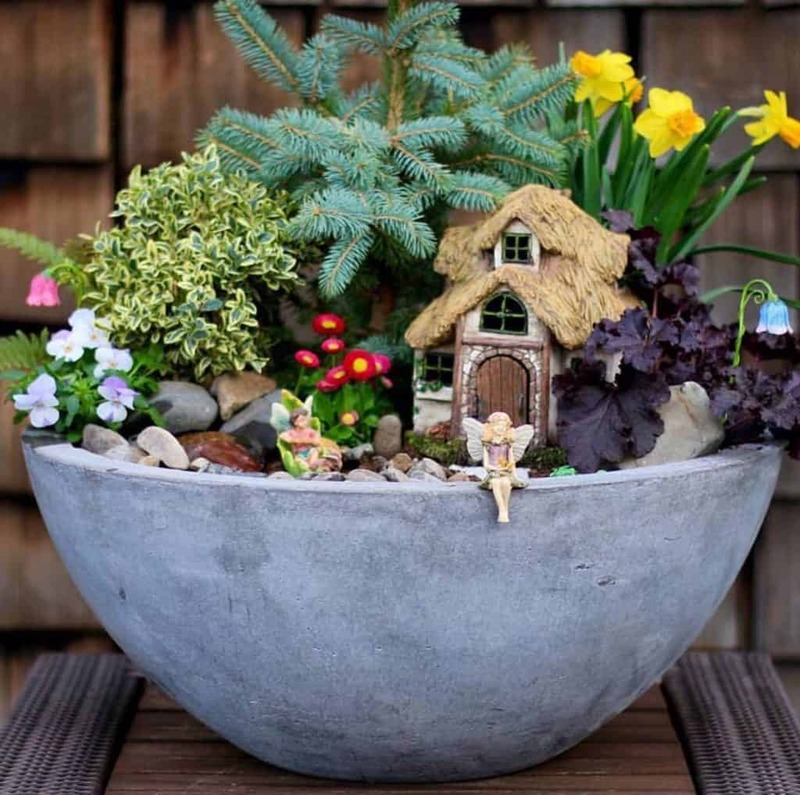 These DIY fairy garden ideas will make your house more unique and fantastic. Try these inspirations alone or with your little ones.